I have an all-time favorite Italian-style casserole dish, osso bucco. For me, this is comfort food. It is a rich, flavorful dish made with meaty veal shanks and traditional aromatics, and punched up with a wonderful chopped herb condiment called gremolata, made up of parsley, garlic and lemon zest. I first became familiar with osso bucco when one of my uncles, a gourmet cook and world traveler, introduced it to our family’s gourmet shop in Miami Beach. He had spent years perfecting his version of the dish in my mother’s kitchen, as he was at heart a confirmed bachelor who loved to cook but needed an audience. Once he got the recipe to his liking, he brought it to the store, where it fast became one of our most asked-for dishes and recipes. Osso bucco is a traditional dish that has its origin in the farming regions around Milan, the largest city in the northern part of Italy, within 200 miles of the Swiss border. It is Italy’s second largest city — its secular, industrial and financial center — and one of the world centers for the fashion industry. 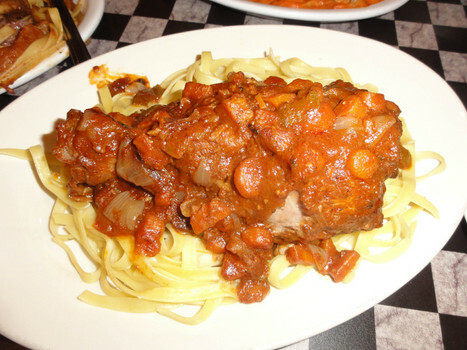 Many of the dishes of the northern regions of Italy are made without tomatoes, and osso bucco is no exception. Traditional osso bucco is a saucy dish that derives its foundation of flavors from red wine and traditional veal stock instead of the more familiar red-sauce dishes of the south. American palates have become accustomed to tomato-based Italian food, and so the version of osso bucco that has become most familiar to us includes meaty Italian plum tomatoes in the sauce. Because red meat isn’t part of my family’s diet, I have found an alternate version of this dish that is fully acceptable to my taste buds, and is otherwise reasonably true to the modern tomato-based version of the dish. It’s made with chicken thighs instead of veal shanks. Additionally, it’s made in a slow cooker, so making the dish requires a minimal effort — chopping vegetables and browning the meat for a few minutes — but is otherwise a simple assembly and is a rich and hearty meal that will win raves in your house. Place the chicken thighs in a hot pan with 2 tablespoons of olive oil and brown on both sides. Combine the tomatoes, broth, wine, carrot, onion, celery, parsley sprigs (reserve the chopped parsley), half the garlic, salt and pepper in the crock of a slow cooker; nestle the browned chicken in the vegetables. Cover and cook on low setting until the chicken is cooked through and the vegetables are soft, about 4 hours. With a slotted spoon, transfer the chicken to a platter, the vegetables to a bowl, and discard the parsley sprigs. Mix together the chopped parsley, the remaining garlic, and the lemon zest. Stir half this gremolata into the vegetables. Serve the chicken and vegetables sprinkled with the remaining parsley-lemon-garlic mixture. Serve the dish immediately with hot couscous or orzo. Traditionally the dish is accompanied by a side of risotto alla milanese, garlic and Parmesan-cheese-flavored polenta, or mashed potatoes. I’ve posted a recipe for the risotto on my blog. In addition, I have posted a recipe for a more traditional version of osso bucco, very much like the one perfected by my uncle Sidney so many years ago.